ORLANDO, Fla. — Procter & Gamble Chief Brand Officer Marc Pritchard said although traditional marketing is being disrupted, CMOs must take back control and drive growth. 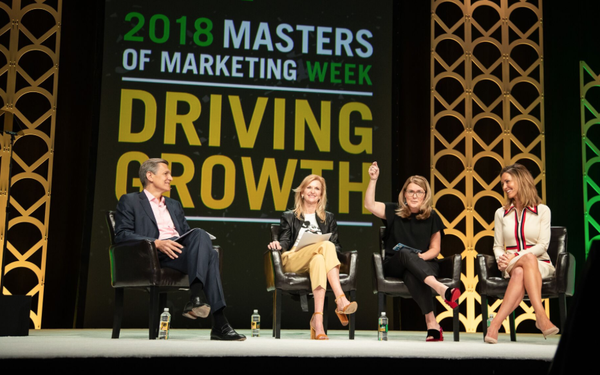 Pritchard, who is also chairman of the Association of National Advertisers board of directors, led a panel discussion on Friday at the group’s annual Masters of Marketing conference which included the top marketers of Deloitte Digital, Walt Disney and American Express. He and the other panelists outlined ways marketers can take the industry by the horns. “This isn’t a panel for entertainment, it’s a panel for action,” Pritchard told the more than 3,000 marketers at the conference. Alicia Hatch, Deloitte Digital CMO, talked about the need to “humanize” data. Hatch said there's still a long way to go to get the best use from data. American Express CMO Elizabeth Rutledge talked about how the financial services company is focusing on four key areas to make sure it is attracting the best talent: employee experience, transparency (making sure you are giving employees access to resources to do their job well), skill development and agility. “I feel very passionate about creating an agile environment,” she said, adding that she also feels passionate about how to create the next generation of leaders. Jill Estorino, senior vice president of marketing strategy for Walt Disney Parks and Resorts, said that although a lot is changing in the world of marketing, customers' "expectations are even higher. Our customers more and more want to be the creators of content, not just engage in the content," she said. Guest satisfaction scores at Disney are rising as a result, Estorino noted. 1 comment about "Pritchard: CMOs Must Take Action To Drive Growth". Ed Papazian from Media Dynamics Inc, October 29, 2018 at 10:35 a.m. But Mark, you left out the great need for CMOs to focus on media, particularly how TV and video time is planned and bought---not just digital media. Must all national TV time buys be of a corporate nature? Does that really work for all of your brands? What about better ways to improve the way national TV time is bought---even on a corporate basis?Are your brand people really well informed about what's happening in TV and what alternative options are really available to them?